Many newcomers to the Pagan Path, as well as new Witches, often mistakenly believe that a Book of Shadows is an ancient concept that goes back eons. There is the very real possibility that herbalists and wise women in ancient times utilized recipe books, journals, or otherwise kept written records containing their secrets or logging their workings. However, the Book of Shadows is actually a neopagan concept that has its beginnings with Gerald Gardner, the founder of Wicca, sometime in the late 1940s or early 1950s. Gardner is the founder of the Wiccan religion along with several other famous pioneering Wiccans who seemingly thrust the neo-pagan movement forward and opened the broom closet for many witches as well. The age of the conception of of Shadows should not cause anyone to question keeping a Book of Shadows. As with any other reference material, a Book of Shadows can be an invaluable tool in any practice, whether it is your craft or your spiritual walk. My working Book of Shadows is a vital part of my Pagan path and my practice as a Witch. As a practicing Witch and a practicing eclectic Pagan with a Matron who guides both paths, I rely heavily on my working Book of Shadows and I carry it with me every day. For the most part, my working Book of Shadows contains all of the information that I need at my disposal such as Sabbats, Esbats, the New Moon, color correspondences, Tarot, Oracle, and Rune draws, as well as trackers for stones, herbs, spells, and Goddesses. I also incorporate my mundane schedule and life in this working Book of Shadows to keep me on track. As any one else in these modern times, I try to keep my spending in check, live a simple life, and incorporate my definition of “enough” into my walk. 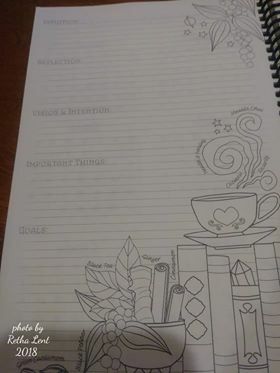 In true frugal fashion, I decided that in 2019 I would take a completely different tact than in any other year and I created my 2019 working Book of Shadows from MAMBI® Classic Happy Planner® extension packs. For clarity and convenience, I have added all of the resources and links for materials and supplies that I have used at the end of this article. Throughout this series, you will notice some “upcycling” of materials as I find cards that I have received, artwork here and there that I notice in magazines, and even the creativity of friends, who make beautiful shaker cards that are great for lifting the energy when I am feeling like energy is being dissipated. A little blingy shake and the smile returns to my face. Also, when you network and discover that friends have hidden talents, such as making quality covers with special meaning that directs your focus to the work at hand, that energy of love, friendship, and community lends itself to a healthy Book of Shadows. Again, as a frugal person, and someone who believes that the Pagan Community could benefit from helping each other, I created a Facebook group called “The Pagan Plannertarium.” I created this home for Pagan Planners who are interested in planning and who could benefit from free stickers and layouts for their own of Shadows. 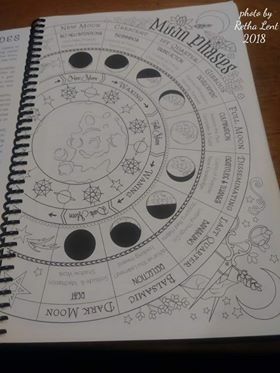 All of the stickers that are in my working Book of Shadows can be found in the Pagan Plannertarium along with an ever-growing catalogue of stickers, layouts, and inserts. They are all free for your personal use, if you would like to plan along with me each month, join the Facebook group by answering the questions for entry, and plan along with me. I will continue this series for the year 2019, showing you the evolution of my working Book of Shadows. Since there are no Sabbats in January, and it is the very beginning of my “Seed Work” which will commence in February for planting on Imbolc, I have chosen a winter theme for the monthly layout, and I have also made complimentary weekly spreads for the entire month of January. In keeping with the winter energies surrounding me, I chose to focus on the correspondences for the month of January which include fox, birch trees, and the colors bright white and blue. January is a time for self-reflection and spell work involving inner workings rather than casting for others, winter is a time to go inward and to work on those things that require change for growth. February’s seed must be planted in order to yield a bountiful Harvest as the wheel turns and we experience each Sabbat in its turn. The January month-at-a-glance spread is where I keep all of my appointments which are upcoming, the Esbat, the New Moon, and I keep a place for notes. In the two blank spaces before the 1st day of January and the last 2 blank spaces after the 31st, I use these spaces for my own personal “Power” words – these are words that I use for the month to keep me focused on my seed work. They relate directly to the seed that I will plant, so I choose the words that I need to focus on to narrow my focus. Times and circumstances change every month and this is a working Book of Shadows so these blank spaces are often in a state of metamorphosis and they change from month to month. January is the month when planning my seed comes to completion and the seed is readied for planting on Imbolc. Each week there is a side dashboard that is sectioned off for my Goddess of the week, Crystals, Notes, and two (2) weekly trackers. My goal is to draw a Goddess card from a deck that I utilize each week, write the Goddess’ name on the dashboard, and key words throughout the week that may arise as I ask for Her protection and energies to guide my week. The Crystal section is for the pouch that I carry on my person each day, some days call for different energies and I may change the contents of the pouch that I use during the week and, if I do so, I like to have a place to log any changes that may occur in my carrying pouch. The Notes section on the side dashboard is to make note of any significant changes that I make, events that I need to make a special note of, or any other information that may change from time to time during that week. Finally, the two trackers that I have are for reminders to check in daily on any spell work that I may be undertaking. Other uses for the trackers include making Crystal Water, Moon Water or other recipes for ritual use. You can use mundane trackers even in a magical practice and, on occasion, when I have no other use for them, that is how I utilize these trackers. The best part of this whole process is that stickers can be lifted, marks can be erased, and things are meant to change and grow as we change and grow. It is my hope that by sharing my Book of Shadows with you, before the pen, you will be able to glean some creativity, some energy, or ideas for your own of Shadows and join me in sharing for the greater good. Each weekly theme for the month of January embodies not only the correspondences appropriate for this month, but some of them also contain themes of strong Divine Feminine figures such as Athena and Hekate. I decided that this month would also contain the energies of the Divine Masculine and The Horned God made a special appearance this month as well. As I called to the Divine Spirits of the East, requesting the energies of communication, divination, and creativity, these layouts pretty much made themselves. Looking forward to providing monthly installments of my Book of Shadows as the wheel turns. 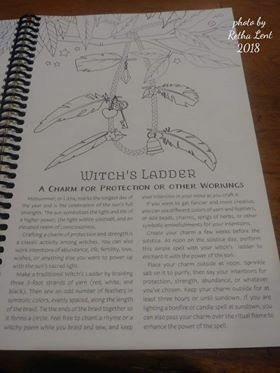 I was lucky enough to receive a copy of the beautiful “Coloring Book of Shadows-Planner for a Magical 2019” from the author Ami Cesari. I have had both her planner and her magical coloring books in the past and have always thoroughly enjoyed them. I am an avid colorist and a fan of planners, so this combination of the two was right up my alley! There are two styles available of this book, both a regular bound book and a spiral bound option. I personally prefer spiral bound, as for me I like having the ability to fold the book in half for ease of use when coloring. Her books are available on amazon right now and this planner is available for the very affordable price of $11.69. This planner/coloring book is just so much fun. It has all the things you want in a planner; full calendar pages, pages with extra room to write your plans for each day, a page for each month for your intentions, moon phase info, other dates such as holidays and sabbats, plus it also includes both a ton of magic themed adorable coloring pages and a lot of informational pages on the sabbats, ritual suggestions, craft ideas, recipes and other topics of interest. There are little pictures included on most of the calendar pages as well, which really adds an element of enjoyment to the task of organizing your schedule. I think it makes me personally much more likely to use the calendar book because I enjoy looking at the beautiful completed pictures throughout. You could color as you go, maybe at the beginning of the month start the images & pics for that month, or you can jump around and color in whatever order you choose. I immediately as soon as i received this book jumped in (I was so excited to get started!) and I began with the title page of the book, then did the January page, then a couple pages that really called to me. I have included the finished pages here that I have completed thus far. Going forward I think I will color it month by month. And I will read the information in order as well and incorporate the suggestions into my routine when called. If you are in need of a really fun, functional and aesthetically pleasing planner for this year, I highly suggest this book. I am absolutely in love with it! It has everything you need plus an added bonus of coloring pages, creative ideas and education as well. I have really enjoyed coloring the pictures I’ve done so far, and I’m pumped to work my way through the rest of it throughout the year. After the year is over you could remove the pics you choose and frame them or incorporate them into your book of shadows or grimoire (I plan to do this for sure). If you aren’t in the market for a planner, definitely check out her other coloring books! I plan to get them very soon. The illustrations are just so cute, witchy and magical and so much fun to color!! I can’t recommend this any higher!! Just a joy from front to back! Thank you to Ami for sending me her fabulous planner to review! What this means is that every 6 weeks you will pay a recurring fee of $85 + $10 shipping and you will receive a new Sabbat Box to help you celebrate the upcoming holiday. There are two versions of these boxes. The $85 WitchBox is called the Major Arcana and is filled with all the Bells & Whistles. They do, however, have a lesser priced Sabbat Box subscription, called the Minor Arcana, and this subscription is only $40 + $7 shipping. This box contains, it seems, a little more than half of what the Major Arcana has. PaganPagesOrg has received the Major Arcana Box to celebrate the Sabbat of Lughnasadh/Lammas and we will be reviewing this box for our readers. The package arrives in a nondescript, plain, brown box. The only writing visible on the box are the addresses. The box does not come addressed from WitchBox but from the owner of the company’s name Jessica White. Their is no logo or pagan symbolism on the outside of the packaging. This is perfect for those who are still in the broomcloset. Upon opening the box my first thoughts were It looks tidy, neat, and organized. The first item you notice is a beautiful card. It definitely brings to mind the sabbat we are celebrating, Lughnasadh/Lammas. When you turn over the card there is a handwritten note. A very personal touch. The second item you notice is a piece of paper. This is the Items List and explains what you will find contained within the box. After you lift the Items List off the top of the box you see the true package begin. The W., WitchBox logo sticker holding together the deep blue tissue paper is an elegant touch to what I am about to find to be a beautifully layered package. to the Holiday…Gods/Goddesses, Crystals, Herbs,etc.. Removing the scrolls reveals the rest of layer one which is filled with individually wrapped items, like little gifts. Each beautifully wrapped in blue paper with the W. logo stickers. The first item I unwrap is a Candle. It is calming & nicely scented. Very smooth to the touch. All items are handmade in WitchBox and the candle looks well handcrafted. The Chamomile is clearly visible in the candle. It is a nice full size not a tiny votive like some would expect. Next I opened the necklace. It is very pretty but not very precious. However, the value lies inside. It opens up to reveal a good amount of Flying Ointment. It is their recipe. It has the consistency of Vaseline and a soothing scent. The last two little packages to open is a Bottle of Incense based on Scott Cunningham’s recipe for Lughnasadh and a Self-Igniting Charcoal Disc. Jessica White clearly states on the Item’s List that it is Scott’s recipe and NOT her own. The incense is placed in a nice corked, glass bottle that allows you to save and reuse the generous amount they send you. The bottle is even labeled on top with the holiday so you will always know what it is for. The self-igniting charcoal disc is a well thought out accompaniment. Layer two opens to reveal one item, the Three Panel Sigil Chain made with kiln-fired birch rounds seems a bit…well birch is birch, and being birch it is delicate. I thought maybe the panels should be thicker so the chains don’t split through the wood. Even though it seems a bit fragile, I believe if I am careful some paint and some free flowing ideas, a beautiful sigil it will make. Layer three is the last layer and contains a Dried Corn Husk Bundle for Making Corn dolly with a Wild Blueberry Sprig. It came in such a neatly, tied bundle packaged in the bottom of the box. I like the idea of including a craft in the collection. Something you can, yourself make. It can be a great altar or house decoration. You could also use it to connect with your children and teach them about the sabbat by creating the Corn Dolly with your child. The only thing I might do different is include instructions on how to create a corn dolly, but those could easily be found on Pinterest, doing a Google Search, or other sites. Our Overall Thoughts on WitchBox… It’s a great box, with a very professional, put together look. The layers were tidy and added excitement to opening the package. It is definitely filled with items to help you celebrate the Sabbat of the month in the correct fashion. For us it was Lughnasadh/Lammas and I felt every item pertained to the celebration. From information about the sabbat, to spells and rituals you can perform. It gives you materials to correspond with the holiday to use in any of your own workings, a lovely item to make into an altar decoration, and a fun craft to do. The box does not come with instructions on what to do with the items it contains, that is up to you, what you would like to use them for. For example, you may use the incense in a ritual for the sabbat. It does come with a full comprehensive list of what is in the box, though, and the ingredients are listed for items which is very helpful to know. The quality of the items is very good, like the large, beautiful smelling candle or the handmade incense. The only thing I mentioned is the birch circles could have been thicker. But overall everything is of very high quality. Though the box may seem a bit pricey, I do understand why this box would cost as it does. In this business you must spend on packaging and supplies to be able to make your goods. Then there is the crafting/labor side that you do not get paid fairly for. Plus as Jessica White mentions (in the short interview to come), she is out daily foraging for her supplies. That adds even more labor you barely see compensation for. There are a lot of natural pieces in this box, the herbs in the incense, the wild blueberries, the herbs in the candle, the herbs in the flying ointment. The box is almost 100% handcrafted, and as we know handcrafters are never paid fairly. If you are a witch with the financial means, a monthly subscription to WitchBox for $85 will not hurt your finances. It does come with items for the sabbat you would have to buy or could buy to celebrate the holiday, anyway. Their is a $40 version of WitchBox. It gives you a bit less, of what the $85 box contains. It contains some of the same items, so I am confident in saying they will be of great quality, as well. I would suggest going with the $85 box, however. You really do get more bang for your buck. You can check out both boxes here on WitchBox and decide for yourself. WitchBox, I feel, is a reputable company PaganPagesOrg can stand behind. So who is behind WitchBox and all the creative goodies inside? Jessica White is the Founder & Sole Proprietor of WitchBox.co and an etsy store front, WhiteWitchhh, selling witchcraft supplies. We recently had the opportunity to ask Jessica White a few questions about herself and her businesses. PaganPagesOrg(PPO): Can you tell us a little about yourself. Where you are from? What path do you follow? Jessica White(JW): I’m a Pagan witch and Massachusetts native. My family has been in Massachusetts since 1715, so I feel a strong connection to the early colonists of the new world who lived off the land, but there’s an old world element to my practice as well. PPO: How do you choose what goes into each Sabbat Box? JW: The contents of each WitchBox depend on what the earth provides in the weeks before each sabbat. The contents are also based on research I do in various compendia of Celtic and Anglo Saxon writings, Ronald Hutton’s research (and combing through his sources as well), and the needs of a modern witch. In many ways, New England serves as a cultural bridge between the old world and new. In the Americas, many of us in the new world have lost touch with our agrarian roots through the generations, so we crave the folklore, traditions, and mysticism of our ancestors. The goal of WitchBox is to get subscribers closer to the land and the seasons, and to walk in our ancestors’ footsteps in the modern day. I serve as your mediator with the land: I forage in the wild on an almost daily basis, respectfully harvest what Mother Earth provides in that season, and I use the wild materials in every WitchBox. PPO: How did the idea for WitchBox come about? JW: I had the idea for WitchBox when someone on tumblr posted about wanting a witch subscription service. It was totally a “Eureka!” moment. Having seasonal affective disorder, I’ve always been very connected to the seasons, so I took the idea a step further and based WitchBox on the Wheel of the Year. This is not the article that I was going to write. I was going to write about Runes. I was going to do a review of the book, Runes for Beginners, by Alexandra Chauran, and write about the history of runes in general. While researching the subject, I looked through the notebooks that comprise my Book of Shadows, sure that I had something about runes. I most certainly did – coincidentally, it was a print-out of a page that I had on my computer screen at that very moment! I had received it in an email from a Yahoo group I was a member of several years ago and printing left a lot to be desired. The end of every line was cut off. As I thumbed through other pages in that notebook, I noticed that many of the other print-outs were in the same condition, plus there were lots of things in there that I really didn’t need or want. So I decided to look seriously at the three notebooks that comprise my Book of Shadows and weed out, clean out and reorganize. divination is like any other discipline. You have to practice on a daily basis to be any good at it. That means daily meditation – at the very least. It means using your tarot cards and your pendulum and your crystal ball. It means getting outdoors and smelling the air and listening to the birds and taking note of the sky. It means being aware of your surroundings at all times, including when you are sleeping. Maintaining good notes is part of divination. Knowing what worked – or didn’t work – the first time, second time or the last time you tried a particular method of divination – or a spell – cannot be overstated. It’s important to note the date, the time of day, the moon phase, even the weather. You often hear – on Facebook, especially, where everything is reduced to a meme – that science and spirituality are at odds, but nothing could be further from the truth. A true spiritualist is just like a scientist. You have to go about your spiritual adventures just like a scientist goes about his experiments. Keeping notes helps you remember one “experiment” from another and adds you in coming up with new theories of divination. Proving these theories is the skill of the diviner. Sometimes it works out exactly like you thought it was going to and you congratulate yourself. But sometimes, something totally different happens and you can’t believe your eyes. Those are some fabulous moments! My first Book of Shadows was a loose-leaf notebook – maybe thirty pages or so – that was a hand-copied version of Starhawk’s The Spiral Dance, which a friend had loaned me in 1987 and I loved so much I didn’t want to return it. Eventually I typed up those pages but once I bought my own copy of The Spiral Dance in 1990, I discarded all but the poetry. I still have those – printed out on my old typewriter that I haven’t had since 1992 – they bring back memories just looking at them. When I first started learning about Wicca and Women’s Spirituality – as it was called back then – most of my learning came out of books. I took copious notes and they all went into my “Book of Shadows”. I really knew nothing about a Book of Shadows or anything else. I was doing it all on my own. But I was doing it. When the Internet took off, I joined Yahoo groups & groups on AOL – remember AOL? – and started getting all kinds of information about Wicca and Paganism and goddesses and gods. I printed out like a madwoman and my Book of Shadows grew from one notebook to three notebooks – I have an inch-and-a-half-wide notebook just for the Tarot and Numerology, the largest of the three books. The Tarot notebook was updated recently – it had always been kept up to date, since I work with the Tarot – spiritually and creatively – more than any other medium. But I do admit that the other two notebooks are rather a mess. There’s a meme on Facebook about intelligent people being “messy” but I do take umbrage with that – I think some kid came up with that when his mother told him to clean his room – “And do your homework too!” – however, the thing about things being messy is that during the process of organizing your mess, you find things that perhaps you forgot about – like I am during this process of going through my Book of Shadows – and either you can’t remember why you kept it – and decide whether or not to keep it – or you remembering why you kept it, you decide you don’t need it anyway, since it’s such a part of you, you don’t need the reminder. Or – in the case of the poetry I just found – you decide to keep it, because it’s an important memento of who you once were and how far you’ve come.